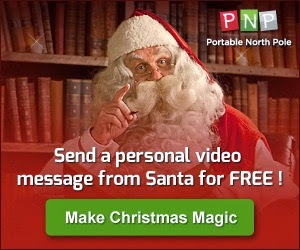 For the past few years, I've used the PNP Portable North Pole (www.portablenorthpole.com) website to create a special video message from Santa for my girls. The first time we showed them their personalised videos, I loved watching the amazement in their eyes as they listened to Santa deciding whether they had been naughty or nice. Now it has become one of our traditions and I can't imagine Christmas without it. The videos take just minutes to create; you are led through some basic questions such as name, gender, age etc, and then you have the chance to upload photos of different events to make it even more special. Santa will mention your child's birthday, or holidays, or favourite toy, and you can watch the look of surprise and wonder on your child's face as they try and figure out how he knows their name and what they've been up to! There are options on the website; you can send your child a free short video from Santa or you can pay just a little for the Premium option and your child will receive a longer 5 minute video. There's also the option to receive phone calls from Santa, along with an extra Christmas Eve video as he sets off and you can now download an App too. If you haven't heard of this website, you should pop over there now. It's a good example of how technology has advanced - I'm sure my mum would have loved to do this for me as a child too, but I'm way too old for it to have been invented! For all my lucky readers I've got a special treat - use this promo code BLG20BKP to receive 20% off all digital products (exluding in-app purchases). Disclosure: we were given access to the site in order to enable us to write this review; all opinions are honest and our own though! Merry Christmas and Thanks Everybody! Christmas gift idea for anyone - Dobble!